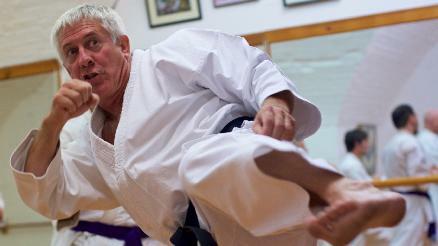 Portsmouth Karate Club and has accumulated a wealth of experience from both training, and grading with some of the worlds most renowned instructors including Masters Enoeda,Shiria, Kase and Tsuyama along with the late former chief instructor to the Japan Karate Association Master Masatoshi Nakayama. Championship honours include both kata and kumite (set forms and free fighting) individual titles to accompany his many team successes with Lovedean, Portsmouth and SEKU along with captaincy of all three. He has been a SEKU grading examiner since 1987, a member of the SEKU technical panel and senior instructor regularlary seen teaching at SEKU black and brown belt courses and instructor classes.